1 A None No Power Seat 1 A is a standard Business Plus seat however, the proximity to the lavatory and galleys may be bothersome. 1 L None No Power Seat 1 L is a standard Business Plus seat however, the proximity to the lavatory and galleys may be bothersome. 10 C None No Power Seat 10 C is a standard Business Plus seat. 10 E None No Power Seat 10 E is a standard Business Plus seat. 10 G None No Power Seat 10 G is a standard Business Plus seat. 10 J None No Power Seat 10 J is a standard Business Plus seat. 11 A None No Power Seat 11 A is a standard Business Plus seat. 11 D None No Power Seat 11 D is a standard Business Plus seat. 11 H None No Power Seat 11 H is a standard Business Plus seat. 11 L None No Power Seat 11 L is a standard Business Plus seat. 12 C None No Power Seat 12 C is a standard Business Plus seat however, the proximity to the lavatories and galleys may be bothersome. 12 E None No Power Seat 12 E is a standard Business Plus seat however, the proximity to the lavatories and galleys may be bothersome. 12 G None No Power Seat 12 G is a standard Business Plus seat however, the proximity to the lavatories and galleys may be bothersome. 12 J None No Power Seat 12 J is a standard Business Plus seat however, the proximity to the lavatories and galleys may be bothersome. 14 A None No Power Seat 14 A is a standard Economy Class seat that has extra legroom due to the exit however, the proximity to the lavatories and galleys may be bothersome. The tray table is in the armrest, making the armrest immovable and slightly reducing seat width. There may be no floor storage during take-off and landing. 14 C None No Power Seat 14 C is a standard Economy Class seat that has extra legroom due to the exit however, the proximity to the lavatories and galleys may be bothersome. The tray table is in the armrest, making the armrest immovable and slightly reducing seat width. There may be no floor storage during take-off and landing. 14 J None No Power Seat 14 J is a standard Economy Class seat that has extra legroom due to the exit however, the proximity to the lavatories and galleys may be bothersome. The tray table is in the armrest, making the armrest immovable and slightly reducing seat width. There may be no floor storage during take-off and landing. 14 L None No Power Seat 14 L is a standard Economy Class seat that has extra legroom due to the exit however, the proximity to the lavatories and galleys may be bothersome. The tray table is in the armrest, making the armrest immovable and slightly reducing seat width. There may be no floor storage during take-off and landing. 15 D None No Power Seat 15 D is a standard Economy Class seat that may have slightly restricted legroom due to the position of the bulkhead. There may be no floor storage during take-off and landing. 15 E None No Power Seat 15 E is a standard Economy Class seat that may have slightly restricted legroom due to the position of the bulkhead. There may be no floor storage during take-off and landing. 15 G None No Power Seat 15 G is a standard Economy Class seat that may have slightly restricted legroom due to the position of the bulkhead. There may be no floor storage during take-off and landing. 15 H None No Power Seat 15 H is a standard Economy Class seat that may have slightly restricted legroom due to the position of the bulkhead. There may be no floor storage during take-off and landing. 2 C None No Power Seat 2 C is a standard Business Plus seat. 2 E None No Power Seat 2 E is a standard Business Plus seat. 2 G None No Power Seat 2 G is a standard Business Plus seat. 2 J None No Power Seat 2 J is a standard Business Plus seat. 25 A None No Power Seat 25 A is a standard Economy Class seat that has extra legroom due to the exit, however, it is missing a window. There may be no floor storage during take-off and landing. 25 C None No Power Seat 25 C is a standard Economy Class seat that has extra legroom due to the exit. There may be no floor storage during take-off and landing. 25 J None No Power Seat 25 J is a standard Economy Class seat that has extra legroom due to the exit. There may be no floor storage during take-off and landing. 25 L None No Power Seat 25 L is a standard Economy Class seat that has extra legroom due to the exit, however, it is missing a window. There may be no floor storage during take-off and landing. 3 A None No Power Seat 3 A is a standard Business Plus seat. 3 D None No Power Seat 3 D is a standard Business Plus seat. 3 H None No Power Seat 3 H is a standard Business Plus seat. 3 L None No Power Seat 3 L is a standard Business Plus seat. 38 A None No Power Seat 38 A is a standard Economy Class seat that may have limited recline. The proximity to the lavatories may be bothersome. 38 C None No Power Seat 38 C is a standard Economy Class seat that may have limited recline. The proximity to the lavatories may be bothersome. 38 J None No Power Seat 38 J is a standard Economy Class seat that may have limited recline. The proximity to the lavatories may be bothersome. 38 L None No Power Seat 38 L is a standard Economy Class seat that may have limited recline. The proximity to the lavatories may be bothersome. 39 D None No Power Seat 39 D is a standard Economy Class seat that may have limited recline. The proximity to the lavatories may be bothersome. 39 E None No Power Seat 39 E is a standard Economy Class seat that may have limited recline. The proximity to the lavatories may be bothersome. 39 G None No Power Seat 39 G is a standard Economy Class seat that may have limited recline. The proximity to the lavatories may be bothersome. 39 H None No Power Seat 39 H is a standard Economy Class seat that may have limited recline. The proximity to the lavatories may be bothersome. 4 C None No Power Seat 4 C is a standard Business Plus seat. 4 E None No Power Seat 4 E is a standard Business Plus seat. 4 G None No Power Seat 4 G is a standard Business Plus seat. 4 J None No Power Seat 4 J is a standard Business Plus seat. 40 A None No Power Seat 40 A is a standard Economy Class seat that has extra legroom due to the exit however, the proximity to the lavatories and galleys may be bothersome. The tray table is in the armrest, making the armrest immovable and slightly reducing seat width. There may be no floor storage during take-off and landing. 40 C None No Power Seat 40 C is a standard Economy Class seat that has extra legroom due to the exit however, the proximity to the lavatories and galleys may be bothersome. The tray table is in the armrest, making the armrest immovable and slightly reducing seat width. There may be no floor storage during take-off and landing. 40 J None No Power Seat 40 J is a standard Economy Class seat that has extra legroom due to the exit however, the proximity to the lavatories and galleys may be bothersome. The tray table is in the armrest, making the armrest immovable and slightly reducing seat width. There may be no floor storage during take-off and landing. 40 L None No Power Seat 40 L is a standard Economy Class seat that has extra legroom due to the exit however, the proximity to the lavatories and galleys may be bothersome. The tray table is in the armrest, making the armrest immovable and slightly reducing seat width. There may be no floor storage during take-off and landing. 41 D None No Power Seat 41 D is a standard Economy Class seat that may have slightly restricted legroom due to the position of the bulkhead. The proximity to the galley may be bothersome. There may be no floor storage during take-off and landing. 41 E None No Power Seat 41 E is a standard Economy Class seat that may have slightly restricted legroom due to the position of the bulkhead. The proximity to the galley may be bothersome. There may be no floor storage during take-off and landing. 41 G None No Power Seat 41 G is a standard Economy Class seat that may have slightly restricted legroom due to the position of the bulkhead. The proximity to the galley may be bothersome. There may be no floor storage during take-off and landing. 41 H None No Power Seat 41 H is a standard Economy Class seat that may have slightly restricted legroom due to the position of the bulkhead. The proximity to the galley may be bothersome. There may be no floor storage during take-off and landing. 41 L None No Power Seat 41 L is a standard Economy Class seat that is missing a window. 5 A None No Power Seat 5 A is a standard Business Plus seat. 5 D None No Power Seat 5 D is a standard Business Plus seat. 5 H None No Power Seat 5 H is a standard Business Plus seat. 5 L None No Power Seat 5 L is a standard Business Plus seat. 50 H None No Power Seat 50 H is a standard Economy Class seat however, other flyers tend to bump into this seat. 52 A None No Power Seat 52 A is a standard Economy Class seat in the last row of the aircraft that may have limited to no recline. The proximity to the lavatories and galleys may be bothersome. 52 C None No Power Seat 52 C is a standard Economy Class seat in the last row of the aircraft that may have limited to no recline. The proximity to the lavatories and galleys may be bothersome. 52 D None No Power Seat 52 D is a standard Economy Class seat that has extra legroom due to the missing seat ahead however, the proximity to the lavatories and galleys may be bothersome. 52 H None No Power Seat 52 H is a standard Economy Class seat however, the proximity to the lavatories and galleys may be bothersome. 52 J None No Power Seat 52 J is a standard Economy Class seat in the last row of the aircraft that may have limited to no recline. The proximity to the lavatories and galleys may be bothersome. 52 L None No Power Seat 52 L is a standard Economy Class seat in the last row of the aircraft that may have limited to no recline. The proximity to the lavatories and galleys may be bothersome. 53 D None No Power Seat 53 D is a standard Economy Class seat in the last row of the aircraft that may have limited to no recline. The proximity to the lavatories and galleys may be bothersome. 53 E None No Power Seat 53 E is a standard Economy Class seat in the last row of the aircraft that may have limited to no recline. The proximity to the lavatories and galleys may be bothersome. 53 H None No Power Seat 53 H is a standard Economy Class seat in the last row of the aircraft that may have limited to no recline. The proximity to the lavatories and galleys may be bothersome. 6 C None No Power Seat 6 C is a standard Business Plus seat. 6 E None No Power Seat 6 E is a standard Business Plus seat. 6 G None No Power Seat 6 G is a standard Business Plus seat. 6 J None No Power Seat 6 J is a standard Business Plus seat. 7 A None No Power Seat 7 A is a standard Business Plus seat. 7 D None No Power Seat 7 D is a standard Business Plus seat. 7 H None No Power Seat 7 H is a standard Business Plus seat. 7 L None No Power Seat 7 L is a standard Business Plus seat. 8 C None No Power Seat 8 C is a standard Business Plus seat. 8 E None No Power Seat 8 E is a standard Business Plus seat. 8 G None No Power Seat 8 G is a standard Business Plus seat. 8 J None No Power Seat 8 J is a standard Business Plus seat. 9 A None No Power Seat 9 A is a standard Business Plus seat. 9 D None No Power Seat 9 D is a standard Business Plus seat. 9 H None No Power Seat 9 H is a standard Business Plus seat. 9 L None No Power Seat 9 L is a standard Business Plus seat. 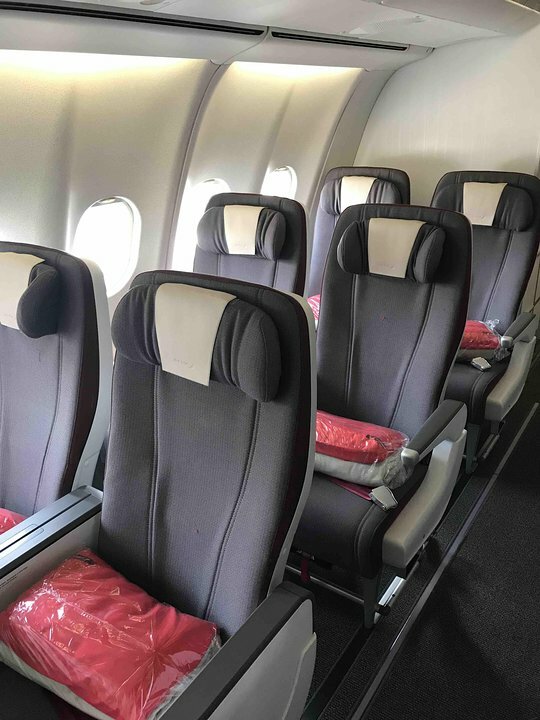 Both Business Plus and Economy Class offer individual TV screens with more than 50 films in different languages and close to 80 choices for TV series and documentaries. This aircraft operates on long-haul routes with 46 seats in Business Plus, and 300 seats in Economy Class, which Iberia refers to as Tourist Class. All the flat bed seats in Business Class have direct access to the aisle. The seat is large and really confortable, and huge space for legs. TV screen is on the side as well as the table. Being close to the toilets, noise and smell could be pretty annoying. This is the type of aircraft you want fly long haul on (MEX-MAD), rather than the modern short aircraft which they try to fit too many passengers in to. Plenty of space in the footwell and the width was perfectly fine. 2-4-2 is by far the the best seat layout as you only ever have one person disturbing you or vice versa to get out of the seat. Long live the true long haul airliners. 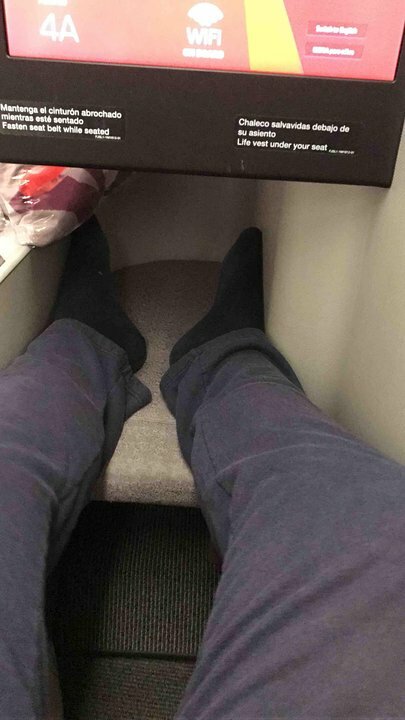 Nice leg room with no obstacles. Although there is no window (reachable rear window when the seat is reclined), it did not mean a problem to me, as I was looking for a quiet place, this was perfectly distanced to bathrooms and galleys. Very nice flight from Santiago Chile to Madrid, this A340 is quiet and comfortable. Very good service on board, food was fine and a fine selection of wines. Good headphones. You can sleep as long as you need to. No complaints. Horrible seat. I don't know this for a fact, but it felt like less legroom than on other carriers with comparable seats. Under the seat in front of you (14J) is a large metal box that contains (I think) the tv screen, since 14J is a front row. So there is even less space here than your average economy seat. Also, no window -- the closest one is *behind* 15L If you get this seat (or 15C on the other side), you better hope you know yoga. Great seat, fast service and comfortable. 2 full windows when reclined. HORRIBLE SEAT - Yes, it is positioned correctly on the map but what the map doesnt show is that there is this massive exit door slide storage compartment in front of the seat, therefore reducing your leg room to something LESS than a standard seat. Also, the positioning with respect to the galley / overhead bin makes it really annoying. Even though it is an exit row, really it should be sold as reduced fare. 40 C is next to the galley BUT it has LEG ROOM! Flight out in a regular narrow row was dreadful to even with people queuing for water (as only one drink is served with the unedible slops that are dished out for dinner) it was comfortable - and in 9 hours only one person decided to do her stretches, others queued and left. Comfortable economy seat 2 Windows on row 42 seats, and lovely wing view of outer engines As quiet as a Boeing 787! Flew this from JFK to MAD. Seat itself is nice - very comfortable and the lie flat is nice and roomy. Pillow and comforter are nice for a plane and was able to sleep a bit. 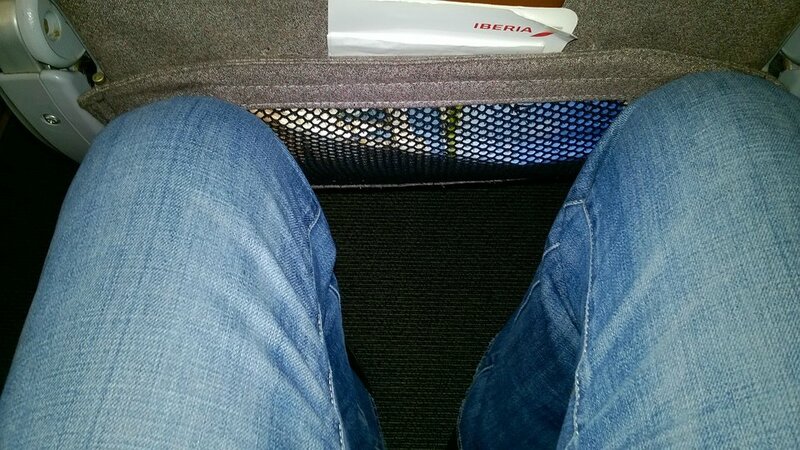 Only bad thing about this seat is getting in and out - the space to enter is very small and awkward to slide through. Food was ok as far as airplane food goes. Seat was nice and comfortable all in all. Would def choose AA or BA over Iberia any day of the week but if this is your only option then I guess its not bad. Flight from Santiago Chile to Madrid. Avoid these seats.We sat in seat 40J and 40L which we had pre-booked at an extra cost to ensure extra legroom. We did have this but I believe these were possibly 2 of the worst positioned seats on the aircraft. They are level with a galley where the lights are constantly on,a constant stream of people using it and standing in front of you. Also the Flight Attendants sat in here and talked loudly throughout the flight. The toilets are right in front of you so our night flight seemed more like party central than a calm night flight. We got no rest at all and trying to watch a movie was impossible with all the distractions. Avoid these seats at all costs if you look at the seat map it seems these seats have been squeezed in. The space between seat 40J and tbe galley was minimal. In comparsion further up or down the plane looked dark calm and quiet. Recommend seats 25 ACJL if you want extra room and a peaceful flight. Great seat, very spacious, when you recline the seat you have 2 complete windows. Great seat, very spacious and lots of leg room, this is an exit seat and if you manage to get this seat in row 25 by the exit lucky you. I believe this row is better that from row in economic by the exit, no one will brother you. The only think is that you don't have a window. Good seat, meal and video. Travel from Buenos Aires to Madrid.